Researchers at the Japan Science and Technology Agency found in this 2012 study that microbes like Geobacter sulfurreducens and Thiobacillus denitrificans can form small electric grids. These species cooperatively create electric currents through conductive minerals in soil, and can probably do so over a (relatively to microbes) large distance. These microbes and others like them are being studied in an attempt to create a source of electricity for humans. Although this idea has a long way to go in terms of development, I think it’s worthwhile to explore the uses of such microbes. 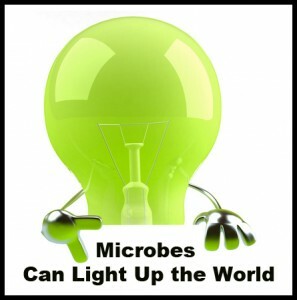 Perhaps one day, microbes will be lighting up our world, in addition to all the other useful jobs they already do for us.